There are so many crochet stitches out there to learn. The moss stitch, the elizabeth stitch, the primrose stitch and more. And with them, they all have their own beautiful patterns. Crocheting is amazing because there are so many options out there. You’ll never get bored and never run out of ways to learn to crochet. While most stitch crochet comes easy, there are some types of stitches that require more work and more time. Take the moss stitch for instance. The crochet moss stitch is a little more advanced than your basic crochet stitches, but it’s still easy enough to learn. 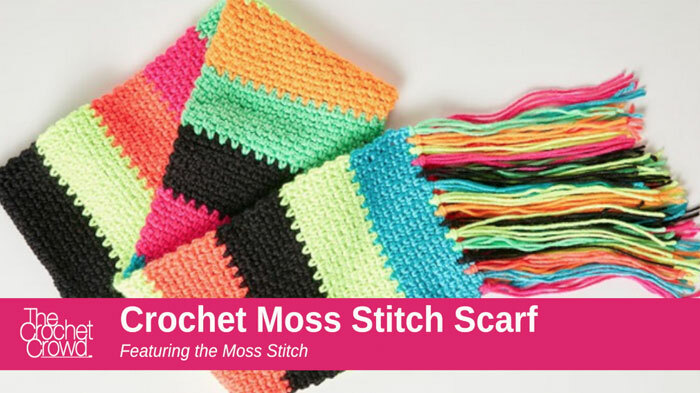 The moss stitch is one of the most popular crochet stitches apart from the foundation stitches (you know, single crochet, double crochet etc.) It focuses on a series of chains and stitches to create the textural fabric. This stitch is also called the granite stitch or the linen stitch. 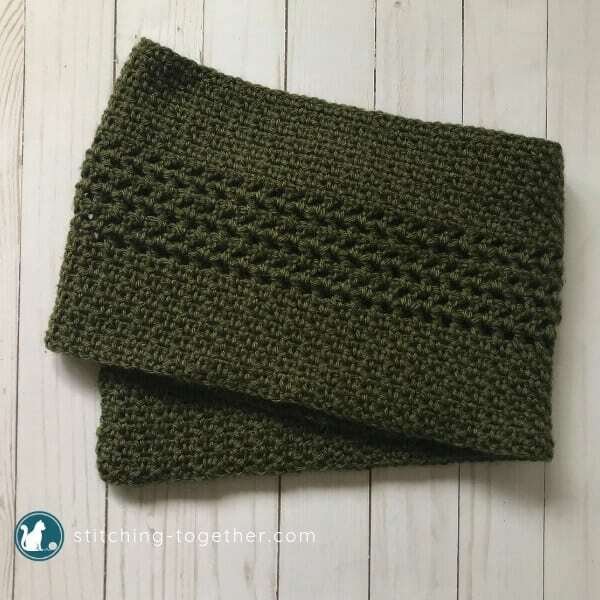 Because this stitch is so beloved, and easy enough to master, I’ve compiled a list for you of 20 free crochet patterns featuring the moss stitch. Before you look through all these gorgeous crochet patterns, take the time to learn to crochet the moss stitch with the pattern below. Row 1: Chain an even number of stitches. Single crochet in 4th chain from hook. *chain 1, skip 1 chain, single crochet in next* repeat to end. Chain 2, turn. Row 2: Single crochet in next chain space. *chain 1, single crochet in next chain space* repeat to end, ending with a single crochet in the chain space from the previous row. … repeat row 2 until you’ve reached desired length. Now that you’re acquainted with the moss stitch, you can make all of these beautiful crochet patterns. As long as you have this stitch in your arsenal, you’ll be set to create whatever you desire. I’m certain you’ll love these patterns as much as I do. This crochet blanket pattern has a mid-century modern style to it. 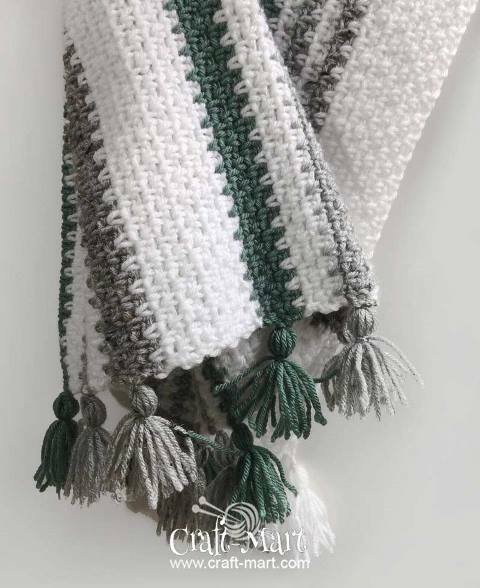 It’s made in two different colors and really emphasizes the moss stitch crochet. The pattern gives it a broken up striped design that makes it stylish and easy to fit into any home. 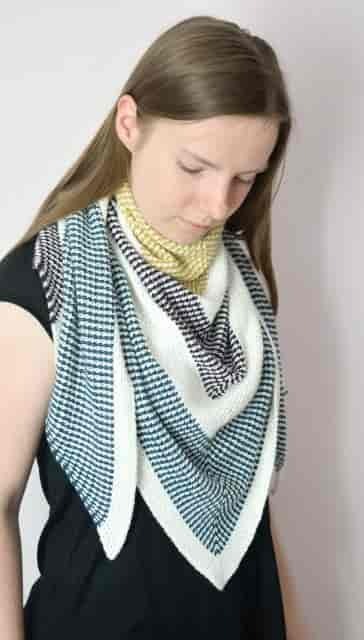 Scarves are the perfect patterns to test out different crochet stitches. The patterns are straightforward and easy to customize. For this pattern, the granite stitch (aka the moss stitch) adds the perfect amount of texture to this simple piece. C2C crochet can intimidate some but don’t worry. 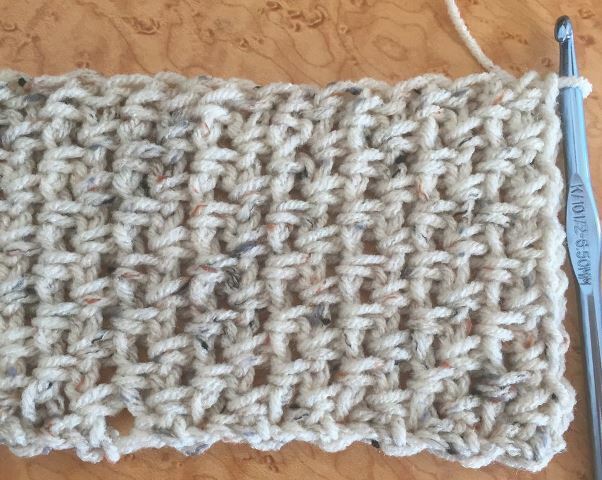 As long as you understand crochet basics, you can do it. There are 3 basic crochet stitches in this pattern, not including the moss stitch. This creates a beautiful geometric piece that can easily be turned into a blanket or something else. 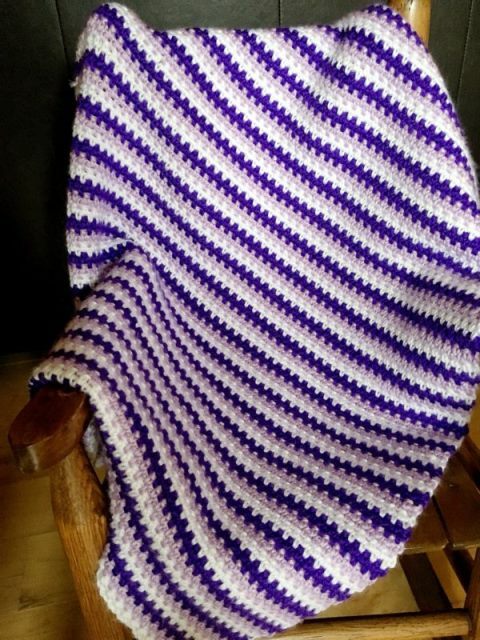 If you want to know how to crochet a blanket, this afghan pattern is a great place to start. It uses easy crochet stitches to create a textured, gorgeous design. It even has added fringe along the bottom. This blanket would look great in the guestroom or as a throw on your couch. This afghan blanket is crocheted in a square design with little tassels on each corner. 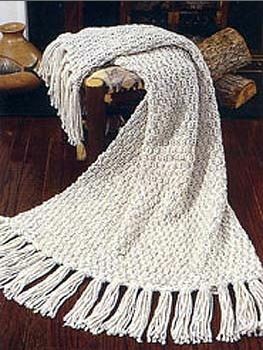 It uses the moss crochet stitch which is thick and textural, and perfect for a cozy blanket. This one is so stylish and really fun to work up. Grab your hook and get started. 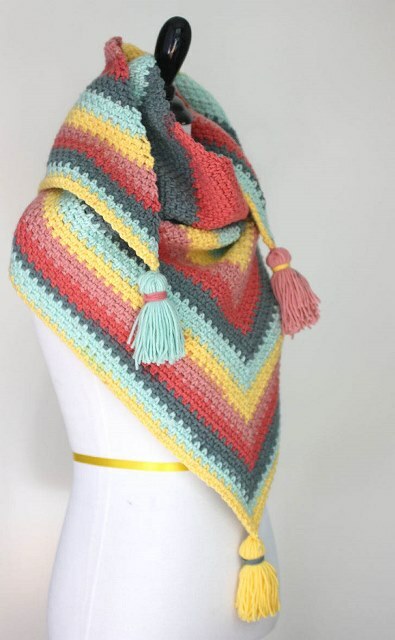 This crochet shawl is beautiful and perfect if you like the look of color blocking. It has thick diagonal stripes running through the piece. It’s made using basic crochet stitches so the pattern is easy to follow. It would look great on a chilly day at the beach of a cozy day at the coffee shop in Fall. 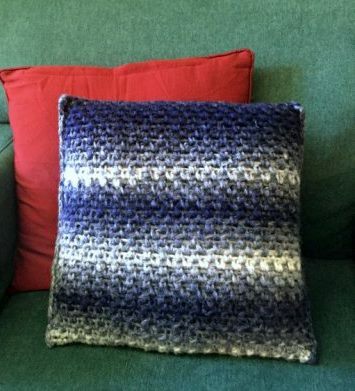 This crochet pillow can be made in all different colors. And it doesn’t use too many types of stitches. The beautiful granite stitch works great here as it adds dimension to an otherwise subtle pillow. 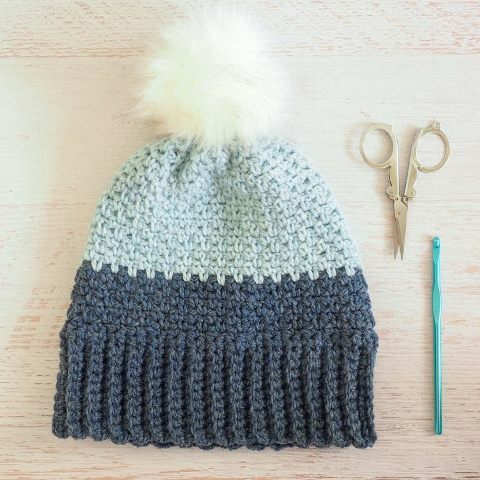 This crochet beanie hat is so cute, and really easy to make. It’s a two toned hat with a fluffy pom pom on the top. It uses some different types of crochet stitches, but nothing challenging. This is the perfect hat to work up as a gift for someone or to keep you warm this winter. This gorgeous crochet stitch pattern is so unique. It creates a gradient ombre effect for this crochet cowl. 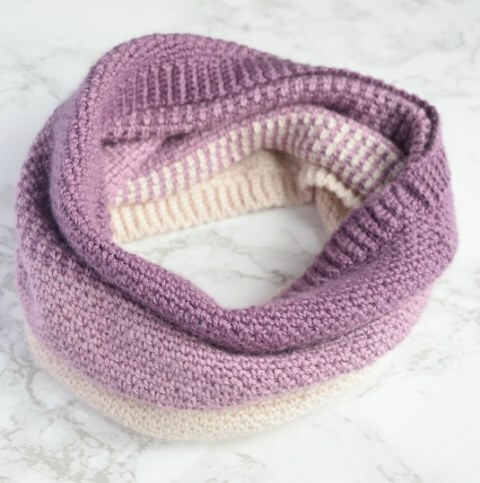 Using light lavender and a soft yarn, this cowl is a dream. Anyone would be lucky to receive this gift. 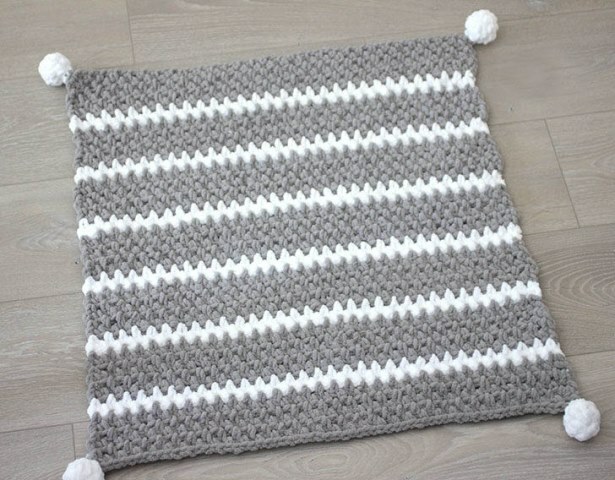 This crochet baby blanket is fast and easy and has pom poms on the corners. How cute is that? 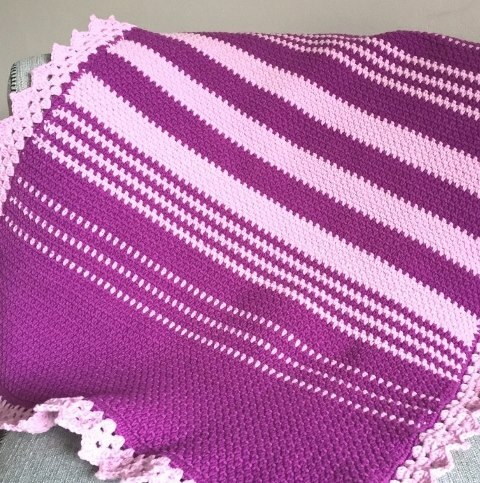 This is the perfect moss stitch crochet blanket for a little one to cuddle up in. Show someone you care and gift them with this sweet little blanket. This unisex crochet scarf works up like a dream. It uses the moss stitch with a fun detail worked through the center of the scarf. This pattern looks impressive but is so simple to make. It’s perfect for all the chilly weather we’ve been experiencing this year. If crocheting relaxes you, this pattern is for you. It’s ideal for beginners crochet because it has a detailed tutorial. 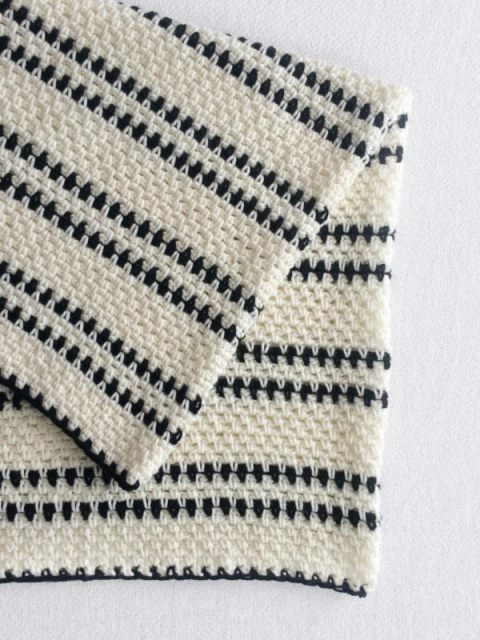 The tutorial walks you through everything you need to do to make this sweet baby blanket. All the cute with none of the stress. There are a few color changes and decorative tassels for added fun. If you want to learn to crochet the moss stitch, this is a good starter project because it’s small. It has a delicate border in white along with white details within the gray cloth. It’s beautiful if you’re having guest over and want to provide them a washcloth. Or keep it all to yourself. The moss stitch makes this project really durable too. This moss stitch crochet blanket has a delicate lace ruffle detail around the edges. It’s also striped and made in beautiful bold magenta. 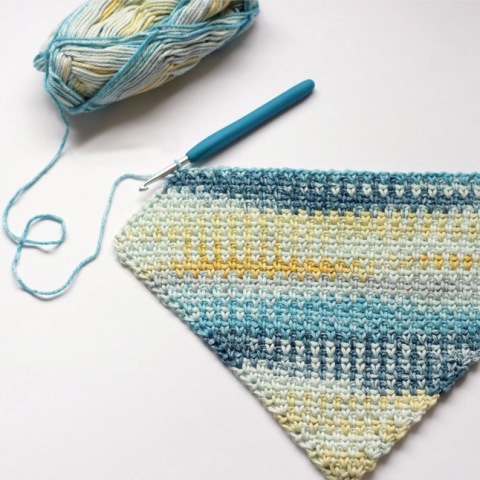 You can choose whatever color you want as long as you stick to your basic crochet stitches. It’s the perfect gift for an upcoming baby shower. This colorful crochet cowl is perfect for accessorizing. It’s thick and warm and uses the crochet moss stitch. This one has decorative tassels around the border and has a really unique look. I would recommend giving this to your artistic friend or someone with a bold, fun style. 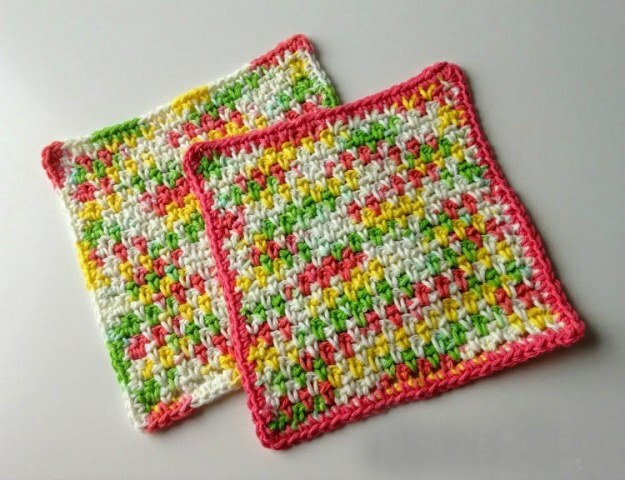 These dishcloths are colorful and durable. Perfect for washing up after guests come over. This is the perfect pattern for beginners crochet as it doesn’t use too many types of stitches. 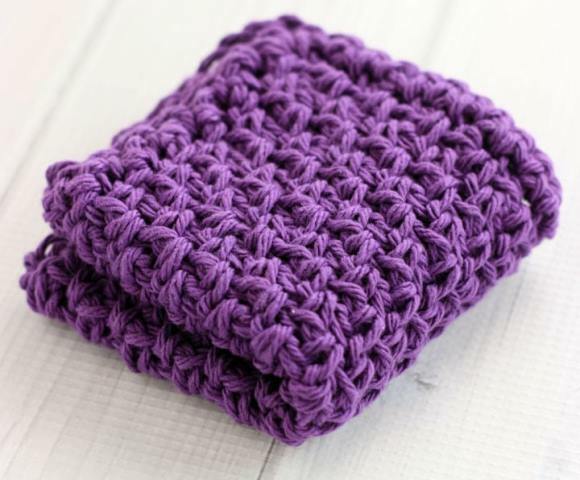 The moss stitch makes a thick, squishy fabric which is perfect for something like a washcloth. They’re sure to become your favorite. 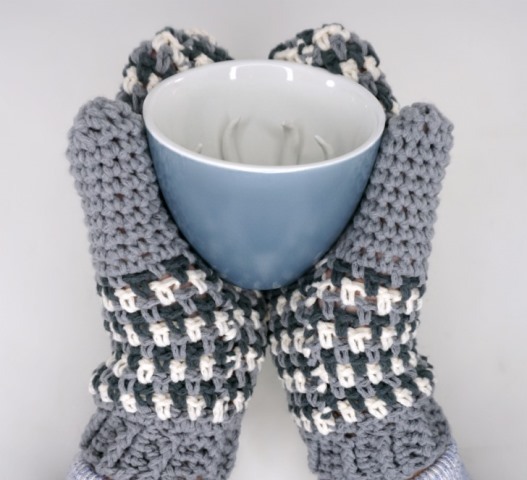 You’re certain to fall in love with these crochet stitch mittens. They’re warm and stylish, and are perfect for holding hands. If you’re planning on crocheting something for someone special, make it these. As long as you understand basic crochet stitches, you can work up these dishcloths in no time. They were designed by a midwestern mom of two, so you know she knows a thing about messes. Make yourself a set of these crochet scrubbies to help keep everything clean and neat. You’ll be doing yourself a favor. 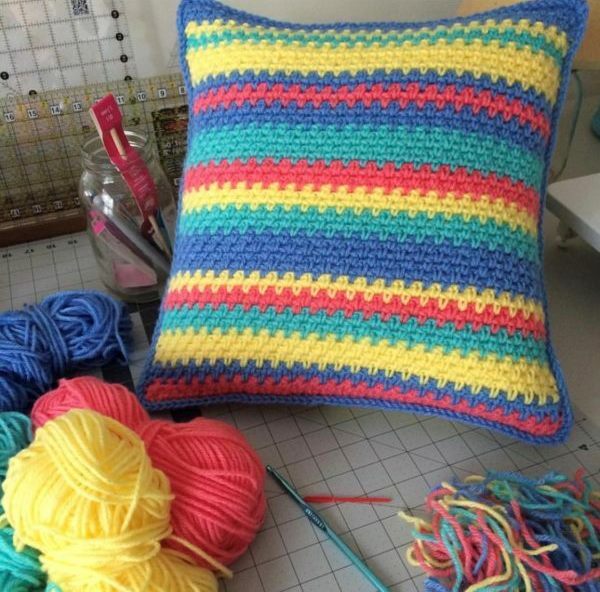 This crochet pillow uses easy crochet stitches to work this up. You’ll fly through this project with the right yarn and a color scheme in mind. The granite stitch is really easy to create and it looks beautiful on a pillow like this. This is the perfect piece to take with you while running errands. It’s simple, sophisticated with a pinch of fun. If you want to learn to crochet, this scarf is easy enough for a beginner. Try out different crochet stitches like to moss stitch to really test your knowledge of the shain and signle crochet stitch. 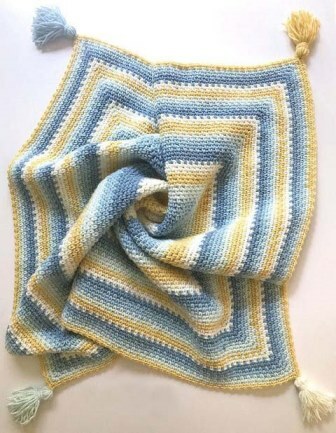 This crochet baby blanket is made from moss stitch crochet stitches. It’s perfect if you want to spend the day crocheting something special and relaxing. The striped pattern is mesmerizing and it sure to help your little ones fall right to sleep. These crochet stitch patterns are unique and colorful, and worthy of your time. As a crafter, we’re always looking for something that will keep crocheting fun. These patterns do just that and more. Test out your knowledge of the moss stitch or learn it for the first time with these awesome accessible patterns.